Is anyone interested with the Z80? The Z80 is still manufactured today and I was wondering whether there is any interest for a community or discussion group. Re: Is anyone interested with the Z80? I did learn on the Z80 but rarely venture into assembly now so would have little to contribute but I'd probably follow along with interest. Here's some of the books I learnt about Z80 from, I donated them to the Cambridge computer history museum last year. That was a nice collection Andy and it's good to know it when to a good home. In Australia we had much larger numbers of the Microbee than the Sinclair machines. I agree with Workshopshed, I programmed in assembly many years ago but would have very little (if anything) to contribute to a current discussion. I would most likely follow it as time permits, but hand jamming assembly code no longer tops my list! What sort of things would you discuss - Z80 has such poor performance compared with modern processors that surely no one would use one in a new project ? Would you believe the Z80 is still in production today? I know it's still being made but so are spares for Ford Model T ! My question was about using one in a new project, is there any reason why one would ? Ah but from the original company? Yes, as a teaching device. The Z80 only consists of about 10,000 transistors hand laid without CAD. But if these could be made using today's transistors (say 14nm) should yoctoscopic and draw next to no power! That also raises the question, of can it be totally modelled in software and hence all cases proved out. What would you be looking at doing? Most off the shelf safety controllers used in industrial applications that require certification (very few safety applications don't!) are dual processors with watchdogs to each from each to ensure that it all behaves according to plan. If you want to certify this application for use then there is a very long road ahead to get certification to the relevant standards. A zap of uncontrolled ESD can put it all at risk. How did Toyota and other car manufacturers get some of their code so wrong to cause safety issues? MISRA standards are only a starting point. For teaching you are better off with the 6502, much nicer design (IMO), far fewer transistors, full VHDL/Verilog models available. @Andy, probably far easier to "prove" a modern design like Cortex M0. In the dim and distant past "proveably correct " micros have been designed but they flopped totally. looked at the individual transistors when I was at school. We did at uni but not that processor. I've used both of these micros and you're trying to compare apples and lychees. Each micro has its own strengths and weaknesses. The most important thing is whether you can accomplish your desired task quickly and easily. VHDL, Verilog and programming models don't necessarily tell you the real story about what's inside the ICs! To do that you have to look at the actual die designs. These processors were aimed at different markets. The Z80 was specifically designed to be backward compatible with the Intel 8080 so that it could immediately run a vast amount of software. About 60% of its die is dedicated for instruction decoding. It also has built in DRAM refresh support. The 6502 used a different approach. It is a cheap clone of the 6800 and due to its lower price was used by many manufacturers. The Apple ][ needed a plug in Z80 board to access the loads of Z80 CP/m software. One obvious reason why the Z80 uses more transistors than a 6502 is because it has four times as many registers than the 6502) and that means lots more transistors are needed. As for speed, did you know the Z80 can exchange the contents of two 16 bit registers in 4 T states. That's 1uS @ 4MHz. Later versions of the Z80 can run up to 50MHz with single cycle execution - That's 20ns for the 16 bit register exchange instruction. Try that with a 6502! As for stack size and flexibility the Z80 can have its stack located at any memory location and be of any size. The 6502 has a fixed size of 256 bytes at a fixed address. As for provability NASA must of thought it cut the mustard because the Z80 was used on the Space Shuttle. It's interesting that when people have built fast versions of old architectures it hasn't turned out to be good business - remember Scenix and the 100MHz PIC ? Programmable logic doesn't count because it can be applied to both! I haven't kept up with modern processors but suspect they can't match the interrupt capabilities of the Z80, and interrupts can really make a design sing. Yep, the Z80 has 3 interrupt modes. IM0 (Interrupt Mode 0) is exactly the same as the 8080 where the interrupting device places a CPU instruction on the data bus during an Interrupt Acknowledge cycle. This instruction is usually a singly byte RST instruction but can be any instruction one wishes. Not often implemented by hobbyists due to the additional hardware involved. IM1 (Interrupt Mode 1) is just a simple RST 0038. When and interrupt is asserted the CPU calls the routine at memory address 0038H. IM2 (Interrupt Mode 2) is popular for hardware designs with Z80 peripherals such as the PIO or CTC are present. To get this working, the programmer must firstly set the CPU's I (Interrupt Register) as the Page number (i.e. the most significant byte) of where the nominated 16-bit Interrupt Service Routine addresses will be placed, secondly configure the supporting peripherals to generate the required interrupt vector (i.e. the least significant byte of the address) to fetch the ISR address, and of course execute IM2 and EI (Enable Interrupt) instructions. Upon exit from an ISR it is usual to perform an EI, RETI combination. The Z80 is configured so that the EI instruction does not become effective until the completion of the following (usually a RETI or RET) instruction. However nested prioritised interrupts can be supported with the insertion of EI, NOP instructions at the beginning of ISRs but appropriate management is required to ensure correct operation. 1. The Z80 can run quite complex programs without any external RAM because of its relatively large number of internal registers unlike the 6502 which has just a few registers and is reliant on page $0 (00-FF) memory to provide full functionality. This fact is great for Z80 test and servicing programs where faulty RAM can be easily detected. 2. Comparisons of their clock rates are irrelevant because they both operate from different timing schemes. The 6502 timing scheme makes it easy to accomplish shared memory access without any contention (but requires double speed memory to do so). Yes, but what to do? Run CPM. If you just want to run CP/m then build my mbed virtual machine. It supports video output, USB peripherals with SDCards! Ladder is a great game to play with it. For its time, I found that the Z80 was an excellent tuition tool. To get the best results one had to design and build their own hardware and not just use it. That fun doesn't occur with premade SMT microcontrollers. One had to experience the aha moments and fails along the way. Is your virtual machine documented anywhere we can access? I'll have to show my brother - he still has a Z80 CP/M monster with dual 8 inch floppies. Did you know that the Texas Instruments TI-83 and Ti-84 calculators have Z80s in them? In fact you can program them in Z80 assembly language. There's also one with a 68000! Did you know the Intel 4004 processor and chipset of a total four chips were designed for the Busicom 141-PF printing calculator. The Story of the Intel® 4004 to read more. More accurately Intel had no idea of how to make the CPUs when they took on the job. Intel had to hire Federico Faggin to obtain the necessary technology and skills. Essentially Federico Faggin took just 9 months of 80 hour weeks to make them. Since Intel didn't want to make CPUs Faggin left and started Zilog with a few of his mates. Zilog's focus was actually the Z8 microcontroller and not the Z80. Thank goodness the Z80 took off! Let's think forward rather than backward; I'll take an octonion vector processor, THX! That's a rather limited numerical use machine. A Z80 made from only 8,500 210GHz SiGe transistors is no slouch (with many of those transistors are just acting as resistors). I found the Z80 to be an absolutely perfect tuition aid as you didn't need a computer to build a computer. The most simple Z80 configuration doesn't require any external memory and can blink LEDS and can also run as a pausable and resettable binary counter. Making it run NOPS? Basically turns it into two 4 bit counters. I have some PCB designs made for that to use as sequencers.Clock as slow or fast as it can go!That's as simple as it gets. That should be the first thing everyone does with one. As a side note-you can buy the Z80 on Ebay for a little more than a dollar each.......The first one I bought in the 70s was way more than that! US supplier Jameco Electronics has the Z80 for 2.49 and also sells the interface chips for even more fun. More like a 16 bit counter but remember that the Z80 will pump out Refresh addresses on (M1) instruction fetch cycles. The NMOS part has a lower speed minimum but the CMOS can be run as slow as one likes. I used Z80's back in the 1980's and used to have a bunch of them around, but with all the other processors now available, they are not something I would try to use today. Too many support chips needed. Given the Cypress PSOC, I would start there instead. As you know I've used both. The issue with using modern parts is that one needs a PC and also allows one to gloss over the fundamentals with everything provided on a platter. Building a Z80 system forces one to at least assemble some hardware, learn machine code if desired, have many more hazards to navigate and develop a full sense of what is going on. Here's a comparison of the different levels of programming learned. Ah but have you looked at the ARM assembly language under the PSOC? I suspect that it might be about as efficient as the Z80 code, but significantly faster. Yes, but how do you program it into a PSOC without an accompanying computer? A typical ARM and Z80 has its RAM access speed based upon the period of its CPU Clock speed. At 8MHz it's 125ns for both devices (and 250ns for ROM on an ARM). As for clock cycles required for each instruction, they require about the same give or take a bit. Things get relatively more complex on an ARM because many of its instructions require 3 operands. Admittedly the Z80 has some limited 3 operand instructions with its index registers. As for speed if we built a Z80 with SiGe transistors it'd operate at 210GHz at that speed it becomes difficult to interconnect it with other components. I kind of doubt that statement, sir. IBM claims SiGe speed records | EE Times back in 2004 claims a 60 GHz speed. But Z80 could operate faster if miniaturized to the degree the ARM is. Always good to be sceptical. Milton Feng and Walid Hafez have an experimental BJT working at 605GHz. IBM and AMD claimed to have switching transistors as fast as 2.0-3.3TeraHertz. At that speed I wonder how they'll dissipate the heat and everything would have to be soo close together to work. As they say in Mortal Kombat - "Most Impressive!" For NMOS CPUS I'd use higher value pull down resistors to cater for the one TTL (or 4 LSTTL) load limit. If you put an 8 way dip switch in series with R1-R8 and a LED and current limiting resistor on the /HALT pin to VCC you can perform other programs. 00011000 18 18 -> JR (+18) similar to the NOP loop but in bigger steps. Hopefully this thread will pick up and get some folks wanting to play. Doesn't have to be a serious endeavor and maybe we can all learn(or re-learn). Thanks for your input-will try it out! I have owned not to long a go, I had bought 2 used Sinclair computer, I had repair and trouble shoot. I only did basic programming, but then I no idea. They both stopped working. Did you know that the Z80 has different memory access timings for instruction fetches and standard memory accesses? No, can you site a URL to see? That is the latest document from Zilog but beware! It contains transcription errors in its diagrams and text. The Z80 also provides in-built Dynamic RAM (DRAM) refresh support which limits its performance. The first of these is the HD64180 where one can tune or even turn off DRAM support for improved performance. Even later Z80 derivatives have single cycle instruction fetch. Dallas even though Mostek was actually in Carrollton a suburb in Dallas County just north of north-west Dallas. Are you still in the Dallas area. So am I.
Yep, lived here all my life (more years than I want to admit to). Wow! that's amazing that you got such a large DRAM board working with Wire-wrap. Do you still have any photos or schematics of it? It was quite rare to come across Mostek parts in Australia. We usually got Zilog, SGS and Sharp. And from memory the SGS parts didn't support the undocumented instructions. for speeding up wire wrapping with one fatal flaw. If two wires pressed against each other hard enough, they could displace the soft insulator and short. "plink" sound so I knew when I found it. the multi-bit/pixel mod and to use a 8 bit parallel interface to the SDB-80. I believe it only had commands for pixel read/write, line and circle drawing. Unfortunately after quite a few sessions of find the Slit and Wrap short I gave up and disassembled it for the parts and never used my Slit and Wrap again. Like I said, fun (and sometimes frustrating) days. The days of triple power supplies (+5, +12 and -12V). It's still available today but not on the e14 catalogue. I used a competing product called JUST WRAP and I think I've still got the blighter! I still have a motorized Slit-N-Wrap and I still use it once in a while. It used to be really fast for wiring low-speed backplanes - much faster than manually soldering connectors on PCBs. I built a circuit that would make it automatically stop wrapping after 7 turns. I never had problems with shorts. They have 2 types of wire, one with a Tefzel (Teflon) jacket that is thicker than normal Kynar, the other is a thin green enamel coating (a bit like magnet wire). I never had problems with either type although I was always careful not to let the green stuff rub on square pins. The Slit-N-Wrap wire is 28AWG and normally 30AWG is used for Wire Wrapping. I usually use 24, 26 and 28AWG for prototyping because I find that 30AWG is a bit too flimsy. Dobs of glue are also useful for holding wires in place. If you want to build a small real Z80 system then you could just deploy a single Zilog Z84C15 Highly Integrated Z80 IPC (Integrated Peripheral Controller). Just add RAM, Flash and your desired electrical interfaces - The pictured system has TCP/IP Ethernet capabilities, runs CP/M, has two true RS232 ports, 2 PIO parallel ports and some Timer Counters . Alternatively you could use an eZ80 which can run at 50MHz with single cycle instruction fetch. If anyone is playing with Z80s and CP/m be aware that Microsoft BASIC Compiler is only marginally faster than its interpreter sister. The BASCOM and interpreter are 8080 based programs that are not optimised for the Z80. From what I have experienced, the compiling a BASIC program results in a huge binary file that consists of the user's original BASIC program with keywords/tokens replaced with generic machine code mechanisms that call up rather large runtime library. A simple (but fantastic) game like LADDER ends up being 40K in size when its Z80 counterpart is magnitudes smaller and efficient. I volunteer at The National Museum of Computing in Bletchley (Milton Keynes). For anyone who is interested, can move fast, and happy to donate to the museum, we have a ton of z80, 6502, Spectrum, ZX81, Commodore etc books we want rid of. No lists, you’d have to visit. It’s a good library to do some research into old machines. Many thanks for the offer but it's a little hard to pop in from Australia. Are you able to take a photo instead of a list? When I went to Bletchley Park a few years ago the Museum was closed. Bletchley Park and TnMOC are completely different entities, albeit on the same grounds. The museum is fully open Thursdays, Saturdays and Sundays and Colossus, Tunny, Heath Robinson and the Bombe are open every day. I can’t take photos unfortunately as the spare books are all boxed up, you’d have to visit - not practical from Australia granted! I now have a list of books in excel format - partial list, more to come - available if you want to see it. I can't see how I can upload it here, but I can always send it to you if you want. They are now with anybook.biz for sale if interested and are a mixture of old technology books, including Z80, 6502, Spectrum, ZX81, Amiga, etc etc. I've not been since the separation from the war museum, I suspect it's changed a bit since I was last there. I assume you mean Bletchley Park? Not sure what was at TnMOC when you last came, but the Bombe is up and running in its new home with daily access - Tuesdays are engineering day so it may not always be running that day but you can still visit and get an explanation. There is also an Enigma machine to support the demo. EDSAC is pretty much done and going through its final tweaks: it can run a program but still some minor issues to resolve. The Harwell Dekatron (WITCH) is in place and that’s a fascinating machine to watch, especially its decimal storage. And of course Colossus, Tunny and Heath Robinson, the air traffic control display and all the 1980’s home computing machines you can play on - who remembers Manic Miner? At the moment the roof is being replaced and the large systems gallery is closed so you can’t see EDSAC or the WITCH (or the ICL and other large systems). Check the website for when that work is finished. Yes, not visited since the split. Saw the Bombe just after it was installed. That site is great in general for all sorts of retro stuff from different manufacturers. Please post a photo of it! I know the original post was a few years ago, but I decided to build a z80. Is there anyone that is currently in a build. I'm not building a kit of anything and am starting to string it up on bread board until I get something working. Have a bunch of ideas but I'm sure they are not new, but new to me. I have experience in electronics and programming in assembler and c. Plan on writing my own os and bios, but will start with cpm. Or the Linux version that was on it . Forgot the name at the moment. I'm happy to observe and assist your with your progress in building a Z80 system from scratch. I've done it many times to produce commercial (10,000+'s of units sold) and self interest projects. If you're using a solderless breadboard the first step is to get the CPU bootstrapped. The first things to do is to get the power supply, clock circuit, and temporary reset circuit up and working. The relevant CPU input pins must be pulled up or down as necessary. Your first program could be a LED flasher. It consists of an LED with current limiting resistor connected to A15 with a 64K program consisting of just NOPs (0x00) that is hard wired to the data bus. Once you've got that up and going it's time to add a proper reset circuit and add a ROM and associated decoding and (POJ) Power on Jump circuitry. If you're planning to work with CP/M you need to ensure that RAM occupies the address space from 0x0000 when in CP/M operating mode. One of the beauties of the Z80 is that you can have a RAMless system that runs useful programs. Consider a useful debounced and delayed response reset button circuit rather than an instant reset circuit. This prevents an accidental touch of the reset button from resetting your system. If you're very clever you may want to incorporate the patented "Special Reset" mode allowing you to run additional ICE (in circuit emulation) and testing software.. If you're a purist, have a look at the system clock signalling requirements and ensure that your clock circuit meets the specifications. Rather than flash lights on the data bus, why not have a separate port to do that by connecting an 8 bit flip-flop to the data bus with its inputs connected to data bus and outputs to LEDs and current limiting resistors and wire its CLK input so that any OUT instruction writes to it. That is what I'm planning. This is just the beginning. I was just starting where I was. I first thing I want to get accomplished is to get memory working and a serial terminal working so I can play around with it. This project will probably never be complete, but just further along . There is a lot of things I want to do but have to take it in steps. This weekend I want to get status LEDs set up. Reading and writing from memory, write an archaic is and watch what it can do. Then upgrade and upgrade from there. Was doing some thinking .I have transceivers between the CPU and the address and data buses. Is it necessary to have transceivers between the memory and the buses, since memory will almost always be involved in most of the bus usage, ie. Dma.? Dreams like there should not be too much draw on the bus keeping memory on it. The chips are only enabled when memory is being called for anyhow. They do you think? Adding transceivers and buffers is a usual task for Z80 older designs when we used to use TTL. The decision to use them depends upon the Z80 variant used. I think the original NMOS variant can only handle IOL=+2mA and IOH--250uA (1 TTL or 4 LS loads) whereas the CMOS variant IOL=+2mA and IOH=-1.6mA so ensure your design does not exceed these fanout limits. If you plan to use DRAM with DMA, you'll need to ensure that all bus masters continue to refresh the DRAM but I'm guessing you'll be using SRAM. I started to use them but as a beginner, and using a breadboard(s), I opted to remove them as to the space, wiring, and debugging, was difficult . I will probably as them once I get a system running. I'm getting really close . I have the z80 reading instructions from room and writing to ram. I debugged that and to my surprise I worked after a few datalines crossed and a few address lines. Now working on the serial interface . I have a question,. Might sound stupid, but I am a beginner. I have some full can crystal crystal oscillators . What is the difference between the full can 4 pin ones and the smaller 2 pins. I've googled it and I must have the search terms wrong because I can't find an answer. Do the full can ones have the capacitors built in? 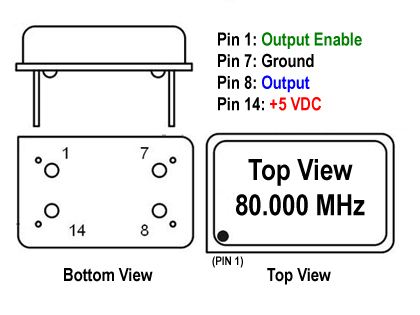 The datasheet I have form them tells me nothing but the pinouts. I've checked the output work my oscilloscope but I think the 7.3436? MHz is to fast for it and am not sure if I'm getting a sine wave or a distorted square wave. I have some 1mhz coming in the next few days off the same style and I'll check them. Thanks. Two pin metal cans are just crystals. They require an accompanying circuit to make the them oscillate. The circuit can be as simple as two or three inverter gates with a couple of feed back resistors and a small ceramic capacitor. The voltage across an oscillating crystal is small and the accompanying circuit will output a suitable or near suitable signal. Here is an example circuit similar to that I used 35+ years ago. For a Z80, it is also necessary to add a 330 Ohm pull up resistor to the output to meet the required clock input specification. You can of course use 7404 inverter gates in lieu of the 7400 NAND gates. Some variance can be used with the resistors. I've used 1K. C2 is just a ceramic (or monolythic) Coulomb bucket capacitor. (Others in correctly call it a bypass or decoupling cap but it's really there as a electron store because there's nothing being bypassed or decoupled). Four pin metal cans whether they be small or larger are often crystal oscillators. It is the crystal along with the necessary oscillator circuit. Only three pins are used. Voltage, Ground and Oscillator output. To use it with a Z80 ensure that the output specifications are correct. What type of Z80 are you using? I've been reading Retro Gamer magazine for the past few months and the ZX Spectrum is reference quite a bit. Sine the magazine is from the UK I suppose this makes sense, however until then I really had not heard of this unit until reading the mag. Building a DIY ZX Spectrum would be interesting to play the old games on. I have a couple but I'm working with the z80b. I have everything working with a manual clock along with a555 time clock running at 20 hz. Above that it is too fast to figure out what itit doing . The can oscillator i have is a 7.something. It will drive a baud generator on a serial interface, but I think it is too fast for the 6850. I have a z8470 dart too and ordered a few things last night. I might try timing a 555 timer to generate a baud need nothin more than 2400 or even 1200 at the moment. I'm not sure how exact the baud generator needs to be to work with a terminal. Early terminals were 300 baud. Oh. Sorry . Just a terminal on my Linux machine. Not the old school dumb terminal . Want to get that running so I can write a monitor program type of thing and load/ dump memory. 300 baud would not be too bad to start. 30sec to load a 1k program is faster than popping rom out programming it and putting it back in. What is the exact part number of the Z80 you're using? It'd be like Z84xxx or Z84Cxxx for the later revisions. This determines the electrical characteristics. Not essential but common baud rate generator crystal frequencies are multiples of 1.8432 MHz - this something that is easily divisible to get most or all of the common baud rates. In the old days baud rate generator ICs (or Z80 CTC) would be used to divide this frequency down to the desired bit rate. (These days they're inbuilt into embedded micros). With the above crystal a divisor of 6144 yields 300 baud, 192 yields 9600 baud. A good project to do is to write an X,Y or ZMODEM program to download and upload files. I'll check when I get home tonight. According to the packing slip it is mk3880bn-l .But I'll check the chip when I get home. I do have a CTC I might try tonight. I do have 1.8432mhz crystal oscillators coming tomorrow. Yes. I remember thoes protocols. Lol. Blast from the past. Lol. Anyway. I haven't had much time to work on it much this week,. I have been doing a lot of reading though on the various chips. Thanks. With an NMOS Mostek Z80 (and with many others) with an oscilloscope confirm that the CPU Clock signal maximum is at least Vcc- 0.6V and below Vcc + 0.3V This is different to the standard Mostek NMOS Z80 signal levels of 2.0V. It's stipulated on page III-72 of the Mostek Z80 Microcomputer Data book. Omg. Doesn't sound like much, but I actually have a working serial interface working with basic working. Thanks for everyone's help but asking my somewhat dumb questions. Where do you people usually get your components and parts from? I live in Connecticut, USA. I have been ordering from jameco. They are located in California. Shipping is usually 4-5 days. Mouser is closer being in the mid West . Also digikey is in the same location. What area your experiences with these places or others in the us? Shipping is usually $5 from jameco. Thank you again. I'm sure I'll have more questions, but I finally have something working and doing something. That's really quick to write your own BASIC! Did you know that 8080 Microsoft BASIC was written on a PDP-10? Please post some pics, vids and schematic diagrams of your new system in action. I get many of my components from Element14! I hunt around for obsolete components that are not stocked by Element14 but beware of Chinese counterfeits! Good ole 68,000uF 16VW capacitors with screw terminals as used for S-100 Bus systems. These capacitors are the size of Soda Pop Cans and are used as filter capacitors for the unregulated +8V power supply. Back in this era the power supplies were comprised of a giant transformer, full wave diode bridges and large filter caps. Transformers had 3 sets of secondary windings. One for 8V with a large current rating (anywhere between 5-30A) and two 12V outputs with about a 1A current rating. Every S-100 board had its own onboard voltage regulators that decanted power from the common -12V, +12V and + 8 V power supply lines. It could take next to forever for an unpopulated S-100 frame for the power to dissipate. It was common to install bleeder resistors across these capacitors on test S-100 power supplies for faster power dissipation.